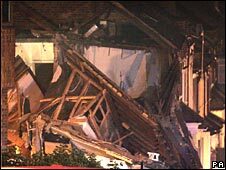 Firefighters are still at the scene of a gas explosion which has left one man dead in north-west London. 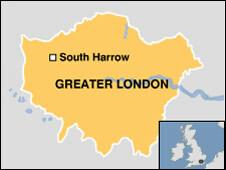 A second man and a teenage girl, pulled from rubble, were also hurt in the blast in Stanley Road, South Harrow. Fire crews are using specialist listening equipment to see if anyone else is trapped following the explosion on Wednesday night. About 30 people were placed in temporary accommodation after the blast - the cause of which is still unknown. Neighbour Paul Redmond, 47, said the blast had rocked his home: "I was terrified, I feared for my life. I've never heard a bang like it." The courier company manager said that two houses on the street were completely destroyed and another was badly damaged. He had been putting his three children, Conor, eight, and daughters Aisling, 11, and Ciara, 13, to bed when the explosion happened at about 2140 BST. "I threw some clothes on them and we ran straight downstairs. Bits of rubble were still falling off next door and people were in the street searching for survivors." The sound of the blast could be heard as far away as Northwood, more than five miles away. A London Ambulance Service spokesman said a 26-year-old man suffering from a serious head injury and a 17-year-old girl, suffering from 20% burns, had been taken to hospital. The dead man's body was found in rubble. Six fire engines and 30 firefighters were called to the scene at about 2140 BST on Wednesday and police sealed off surrounding roads and set up a cordon. John Gaffney, station manager for London Fire Brigade, said: "At this point we are assessing if anyone else was involved and we are still searching with specialist listening equipment." The process would continue for a number of hours, he said, but if no sounds were heard the building would be made safe and police sniffer dogs brought in. He said two houses had been completely destroyed by the explosion and another had been partly damaged. Glass from the blast had been found in a neighbouring street. 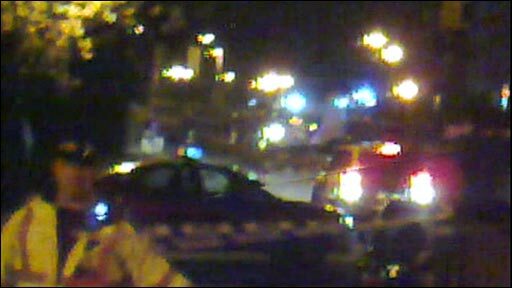 The man who suffered head injuries had been released from hospital, he added. A spokeswoman for Harrow Council said about 30 people, including some children, had to be evacuated from homes in Stanley Road and taken to a Royal British Legion building nearby. "We are sorting out emergency accommodation for everybody. Some people have medical requirements and we are making sure they are attended to." Residents of nearby streets were held at police cordons for a number of hours before being allowed home late on Wednesday night. Gas engineers are at the scene trying to establish the cause of the blast. A National Grid spokeswoman said: "They will carry out some checks. It could be some time before we know exactly what has happened." Another neighbour, Dan Llewelyn-Hall, said the explosion blew out the windows and doors of his own home. "I looked out the window and the two houses were completely razed to the ground," he said.